Not every meal you serve will be picture perfect. While mishaps can happen, you can save the day by having a backup meal plan. It stands to reason that not every meal you plan will go the way you want it to. Life happens. The power goes out. You forget to thaw something. Such is life in the modern age. We don’t spend all day working out our sustenance like Ma Ingalls, so somethings slip our minds. Even mine. As my husband and children can testify, not every meal I plan goes the way I want it to. In fact, one Christmas Eve when the shrimp feast I had planned didn’t happen, we headed out Panda Express and made the most of it. My kids were thrilled with their “Panda feast”, but I was a little disappointed that I hadn’t planned better and that some extra hard-earned dollars flew out the door. Thankfully for our budget, take-out doesn’t have to be our only options when it comes to dinnertime mishaps, especially if you have a backup meal plan devised in advance. Prepare for quick and easy desserts. But what about the main meal? Sometimes when you’ve planned to serve a meal to guests or family, it doesn’t always go according to plan. What do you do then? Have a backup meal plan! A backup meal plan doesn’t have to be fancy, but it can be fun! Consider these options for possible backup meal plans, with company or without. None of them take very long to prepare, as long as you’ve got the ingredients on hand. 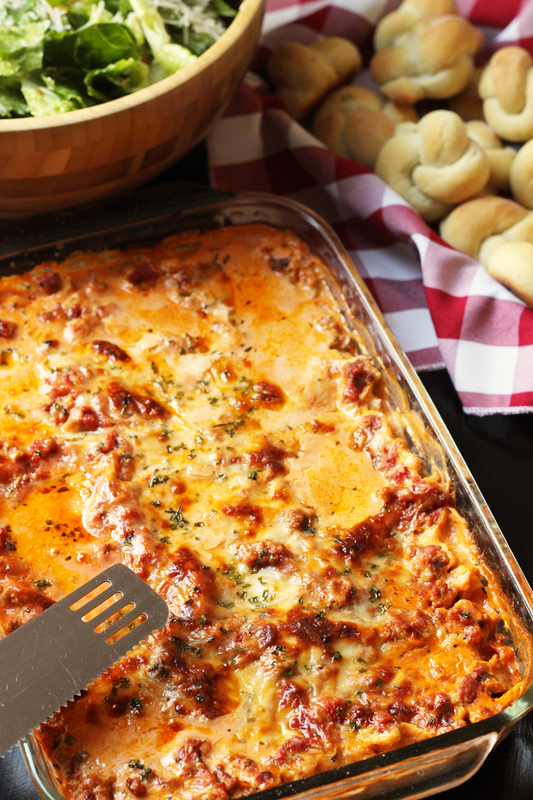 Stash this easy lasagne or pan of enchiladas in the freezer. 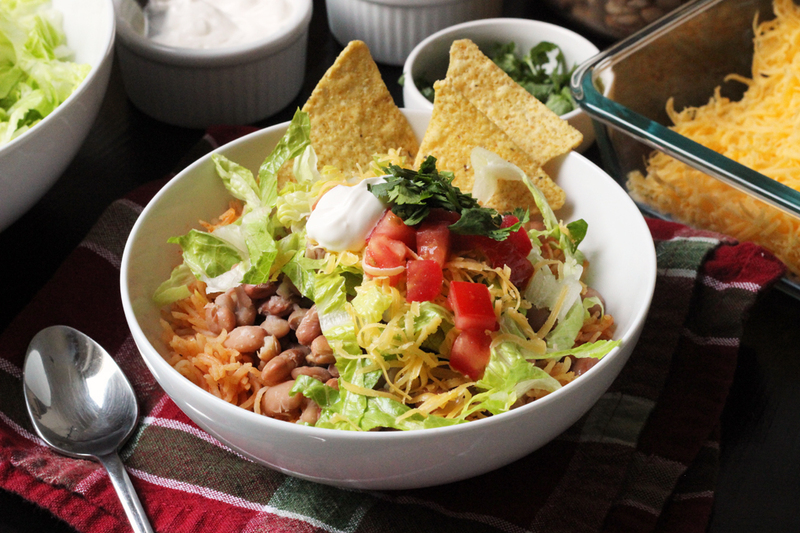 Keep canned beans, rice, and some fun toppings on hand for cheap and easy Beans and Rice. Load up on noodles and your favorite sauce for an impromptu pasta feed. Prepare Thursday Night Soup with whatever you got and mix up a batch of Buttermilk Cornbread. Stock your pantry with the ingredients for the Quickest Chili in the West. Ready in 20 minutes! Call for Chinese food or a pizza. It happens! Remember that presentation matters. How you present the food you’re serving to family and/or guests makes a big difference in how it is received. use serving dishes instead of commercial containers. make sure there are a few different side dishes as well as a bread basket. There’s no reason that using a backup meal plan should take the fun out of your evening. Plan accordingly and it will still be a great night! What are your favorite Backup Meal Plans? The turkey appeared to be thawed, but after 3 hours in the oven it was clear it was not and therefore would not be safe to eat. Now what? We happened to have a ham, which we sliced and warmed in the oven and served with all the other side dishes. To this day, during the holidays I keep a ham on hand. If we make it through the holidays, I serve the ham on New Year’s Day along with black eyed peas for luck. So glad I had that ham in the fridge this year! Due to canceled travel plans (bad weather cancelled flights) we had several last minute guests for dinner Christmas night. I obviously was not going grocery shopping on Christmas Day so what to do? I threw that ham in the oven alongside the turkey and doubled the amount of mashed potatoes. We had an assortment of apples in the crisper that I turned into an apples crisp. At the end of dinner everyone was happily full, our unexpected guests did not have to eat home alone and we enjoyed the extra company immensely. It was the most satisfying part of the holidays for me this year. All because I had a backup plan and well stocked pantry. One year we had scrambled eggs for Christmas dinner. I was tired, nine months pregnant with our fifth, and had taken a nap instead of putting the ham in the oven. I usually turn to Mexican food as a backup but one meal I used to get at a vegetarian restaurant in town was called Basic Plate. It had brown rice, steamed vegetables and kale along with a bean usually navy on the plate not mixed placed in their own section like a toddlers plate. I believe they made a tahini sauce to drizzle over everything. They made it nice and fancy and it was always filling. Even though we eat a lot of meat now I may keep this as a backup. Last night’s back up dinner was rice and beans. Comfort food for sure. I sautéd some grated carrot, diced onion, tiny bits of broccoli, 1 clove minced garlic with 1 cup of rice and 1 tsp salt and then added 3 cups of water and another 1/2 cup of rice, brought it to a boil, turned it down and let it simmer while I set the table and tidied up. Once the rice was cooked and fluffed, I added 1 can of rinsed black beans and let the beans warm up while a side dish of vegetables cooked for 5 minutes in the microwave. Everyone liked it and I felt like a superstar for saving money and for not having to run to the store for a deli chicken. Anything to avoid time in traffic right now! Sounds delicious and a great way to stay home! My usual meals when I need something immediately involve pasta, or chili. That’s because my freezer and pantry are usually stocked with the basics, pasta, broth, canned tomatoes, spaghetti sauce, chicken and beans in the pantry; and usually some chopped onions and cooked meat, especially ground beef or turkey in the freezer. It is easy cook pasta in chicken broth and add some chicken to it; or cook up some spaghetti or shell pasta and add spaghetti sauce with meat to it; or heat up some beans and tomatoes with onion and seasonings then usually adding a pkg. of ground meat to it for chili. I also keep rice on hand, but it takes a little longer to cook. Pasta salad can be easy if you have pasta, some canned chicken, dressing and pickles or some frozen veg on hand. It used to be my fall back, but I don’t do it as often since I have to limit fats. I sometimes just make vegetable soup with canned green beans, tomatoes, carrots and broth as the base with some onion ( frozen or dried) added. Then I add in some meat, or canned white beans and maybe even some cream style corn. It varies, but my husband seems to like all the variations. Soup or chili is especially good in cold weather, I think. The main thing, I think is to have what you need on hand in pantry and or freezer to fix something quick and easy if you need to because; the meat didn’t thaw, you forgot to thaw it, or you didn’t get home in time to cook. The reasons to need a quick meal are many, but they happen to everyone and planning makes it easy to cope. I think maybe the fact that I was a country girl when learning to cook leaves me more aware of having a stocked pantry and freezer. I like to chop up leftover chicken or meat and freeze them in broth. I also buy ground meat on sale and cook it up before freezing it. This heats in pasta sauce, soup or chili very quickly and makes many different meals in a hurry. Up until recently, my backup meals have been frozen pizza or breakfast for supper. Now, I purposefully cook things to put in the freezer. I’ve got a family of 3 (4 when my son is home from university ) so I make recipes that serve 8, then divide it in half and freeze half for another night. We eat three servings for that meal, and I have the fourth serving for lunch the next day. I even made a 10 serving batch of individual servings of lasagna (each in its own little disposable load pan). The lasagnas are great – partially cooked before frozen, then 8 minutes in the microwave (after taking out of the pan), or one hour directly from the freezer at 350 degrees. I also try to keep cooked chicken in the freezer. It’s great for all kinds of things. Last minute chicken tacos. Chicken alfredo. Chicken salad. Filling for enchiladas. So very versatile. I also make a “turkey chili-like substance”. 🙂 I always have a roll of ground turkey in the freezer, so I thaw it, cook it up with onions, beans, tomato sauce and spices. It’s usually pretty good, and on the table in about 30-45 minutes. I always try to keep canned beef stew, chili, or tomato soup on the shelf if I need a quick meal. Chili dogs with mac and cheese, grilled cheese and tomato soup or beef stew with biscuits are my family favorites so they don’t even realize that these meals are my plan b, c or d.